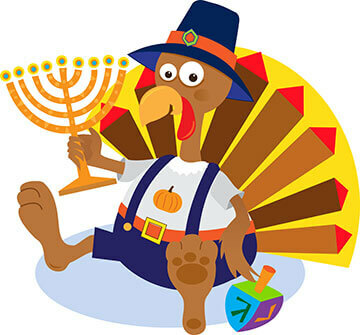 Today is the only opportunity Jews have to get away with putting Hanukkah candles in a turkey. Yes, this is a thing, and yes, it is Thanksgivukkah. This mesh of holidays won’t happen again for about 79,000 years, so families are making the most of it. But what’s the point of celebrating something we have never done before and will never do again in our lifetime? If the menorah-key isn’t selling you, these reasons might. You get an overload of family time. For Hanukkah, Stephanie Rosner usually celebrates with a big family dinner and enjoys her favorite dishes from her mom’s homemade cooking. For Thanksgiving, they schmooze at her grandma’s house with traditional meals. But with both holidays on the same day, Rosner’s family get-togethers are doubling in size. Cousins whom she hasn’t seen in a couple of years are coming to visit. Between relatives and immediate family, she said she is expecting a schmorgesborg of about 50 people at Thanksgivukkah dinner. The Northwestern University freshman said it’s a great opportunity to see her family all at once for the holidays. She likes the idea that her family is coming together for more than one purpose. “It’s fun to look at the two holidays together,” shesaid. You have an excuse to stuff yourself more than usual. The combination of holiday dishes is like getting two for the price of one. Who can resist a deal like that? Julie Kaden, a freshman at Kennesaw State University, said the excess amount of food on Thanksgivukkah works out perfectly, but now she has nothing left to look forward to in December. No other holiday can compare to the mouthwatering meals of Thanksgiving — turkey, stuffing, cranberries and satisfaction. But Hanukkah is not too far off. Latkes, kugel and donuts fill up the refrigerator for days upon days of leftovers. Americans love food. Jews love food. Thanksgivukkah is the best excuse to pig out (no pun intended) for the feast of all feasts. “The latkes will compliment the turkey,” Kaden said. Stephanie Byer said Thanksgivukkah is like a traditional holiday with an added flare. The Guilford College sophomore said it is a fun atmosphere that combines the best of both holidays and enjoys the fact that they are uniquely meshed together. Since she wasn’t home for Hanukkah last year due to final exams she is excited to celebrate both holidays at home with family. But when she thinks about it, Byer said Thanksgivukkah is a silly idea, but in a good way. She said we have the chance to experience two holidays that we’ve grown up with all our lives on the same occasion. “The title ‘Thanksgivukkah’ is the best part of it,” she said. You have twice as much to be thankful for. Both holidays are based on the idea of being thankful. Thanksgiving is obviously a day for counting your blessings, whether you are happy to be with family or grateful to get a day off from school. Hanukkah is the story of a miracle in which the Jewish people were thankful to win the war against the Greeks and gain religious freedom. 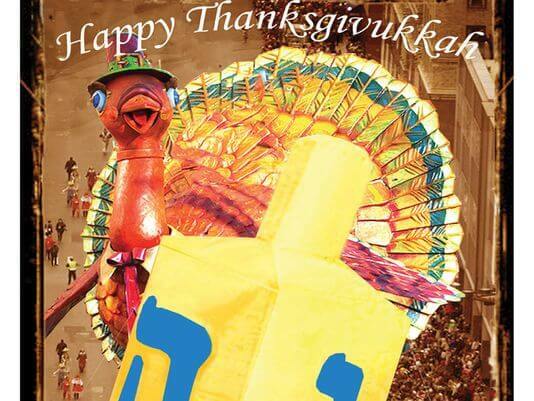 So whatever you are thankful for, Thanksgivukkah is the prime time to show it. Be thankful that you can actually celebrate this once-in-a-lifetime holiday. So to all the Jews out there, have a happy Thnaksgivukkah and of course, a safe trip to the mall after dinner for Black Friday deals.